• PLOT SUMMARY: Pencils by Justiniano, inks by Livesay & Walden Wong. Part 1 of "Truth or Dare," a 2-part crossover with the March-shipping WONDER WOMAN #214! The Cheetah has come to Keystone City in search of the man she believes can teach her to be faster: Zoom, the Reverse-Flash! 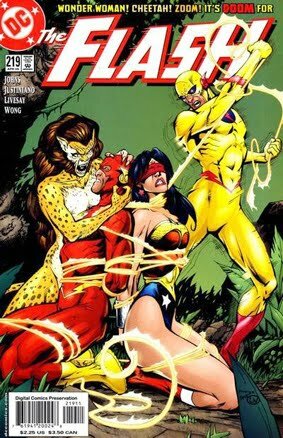 And where the Cheetah is, Wonder Woman can't be far behind!